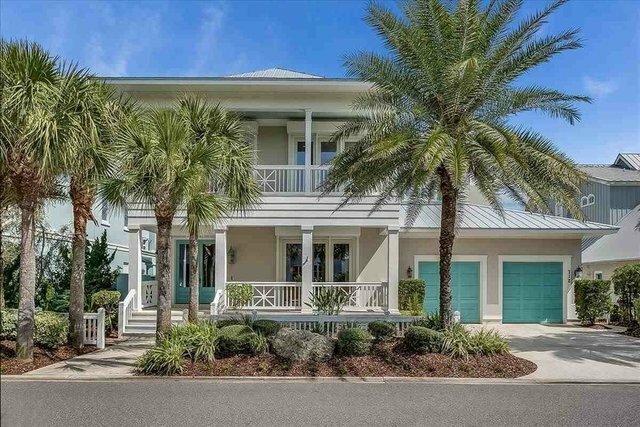 Single Family Home, Single Family - St Augustine, FL Sprawling Views Of The Atlantic Ocean And The Wide,Pristine Sands Of St. Augustine Beach Define This Exquisite Ocean Front Home. With A Spacious,Open Floor Plan And Abundant Sun-streaming Windows,The Ocean Promenade Masterfully Captures The Beauty And Serenity Of Beach Front Living. The Luxurious Interior Of This Dream House Features Four-inch-wide Hickory Wood Flooring,Elegantly Crafted Molding And Trim And Ten Foot Ceilings Throughout. The Beach Facing Side Of The Home Is An Array Of,Floor To Ceiling Windows And Glass Doors,Offering Endless Views Of The Ocean And Allowing Natural Light To Pour In Upon Sunrise Each Day. On The First Level,Built-in Cabinetry And The Homes Unique Ventless Isokern Fireplace Made Of Icelandic Volcanic Stone Add Ambiance To The Living Room. The Newly Renovated Gourmet Kitchen Includes White Custom Cabinets With Glass Doors,Stunning Quartz Countertops,Stainless Appliances,Including A Built In Double Oven And Sub-zero Refrigerator,And A Charming Breakfast Nook Steps Away From The Rear Veranda And Pool. The Spacious Dining Room And Adjacent Wine Bar Accented With Bead Board Are Perfect For Entertaining. The Front Study/Library Completes The First Floor,With Its Rich Cypress Wood Walls,Built-in Cabinets And Coffered Ceiling. Whether You Walk Up The Hickory-lined Stairs Or Ride Up In The Mahogany-paneled Elevator,A Warm Oceanfront Lounge And Veranda Welcome You To The Second Floor. Awaken To A View Of The Atlantic Ocean From The Opulent Master Suite,With A Room Size Closet/Dressing Area And Lavishly Appointed Bath With Jacuzzi Whirlpool Tub And Sisal Stone Shower And Floors. In Addition To The Master,Three Impeccable Bedrooms With Baths Featuring Tumbled Limestone,Marble And Tile Are On The Second Floor. With Teal Accents On The Exterior,Wide Overhangs And Lattice Railings On The Porches And Verandas And A Brand New Metal Standing/Seamless Roof,The Ocean Promenade Was Designed With Old Florida Elegance And Style.